Experts offer advice on the finer points of vendor contracts. With the pressure mounting on health care organizations to reduce costs, many large facilities and networks are outsourcing transcription services to fill at least some of their transcription needs. In fact, Cindy Barker, president of the transcription division at Amphion, believes approximately 75% of such organizations rely on some outsourcing, with facility size being a significant determinant. Prior to the advent of speech recognition, transcriptionists essentially utilized all keystrokes. A space was considered a character and necessary to properly format the document. With speech recognition, many transcriptionists now are editors who no longer need to perform the same functions on the keyboard as they did in the past. Therefore, pricing using the VBC method instead of on a per line basis is much less of an issue from a vendor’s standpoint. When it comes to vendor-client couplings, the chances for harmony often come down to the basics. 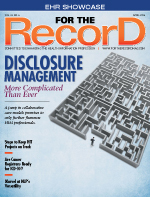 “If clients are getting accurate patient records, if they have confidence that their vendors are doing what they say they will do—and the vendors need to be able to demonstrate that they are delivering accuracy and promised turnaround times—those are the main critical factors [for a winning relationship],” Sullivan says.